Home / Allergies / Food Allergies and Eczema – Are They Related? Eczema affects up to 20% of the U.S. population and is formally known as Atopic Dermatitis. Eczema is one of the conditions that make up the Atopic Triad (eczema, hayfever, asthma). Eczema typically appears as red, scaly, pruritic patches that affect different parts of the body based on age. For babies and toddlers less than 2 years old, the face and extensor/outer sides of the arms and legs are involved. For toddlers 2 to 5 years old, the flexural areas of the arms (antecubitals) and legs (popliteal) are typically involved. For older children and adults, all parts of the body can be affected. Up to 30% of children under 5 years old with eczema have a food allergy. There is always the chicken or the egg question of whether eczema causes food allergies or food allergies causes eczema. The simple answer is that it is not that simple. However, what we do know is that there is a definite increased association of food allergy in individuals with eczema. AND- Children with moderate to severe eczema should be tested for a food allergy. Let’s learn more about food allergies. Food allergies affect up to 15 million people in the U.S. and specifically up to 4 million children in the U.S. That figure means 1 in every 13 children will have a food allergy. Peanut is the most common allergen followed by milk and then by shellfish. That statistic means that up to 2 kids in a single school classroom of 25 to 30 kids may be affected by a food allergy. Between the years of 1997 and 2011, the percentage of children with a food allergy has increased by 50%. Remember, it is not just peanuts that cause a food allergy. 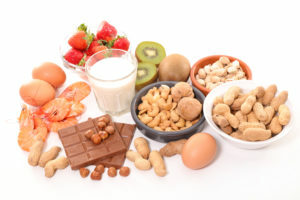 The most common causes of food allergies are peanuts, tree nuts, milk, eggs, wheat, soy, fish, and crustacean, shellfish. Food allergy affects up to 8% of children up to 3 years old, and peanut allergy, specifically, affects up to 3% of children in Western countries like the United States and the United Kingdom. Peanut allergies have doubled over the past decade. Back in 2000, clinical practice guidelines in the U.S. and the American Academy of Pediatrics recommended to parents the avoidance of peanut and allergenic products in high risk infants by excluding allergenic foods from infants’ diet as well as excluding these foods from a mother’s diet during pregnancy and lactation. Clinical practice guidelines in the U.K. recommended the same at that time. These guidelines recommended peanut avoidance before the age of 3 years old. It was thought that these recommendations could help prevent a peanut allergy in a child. However, both the U.S. and the U.K. saw the opposite effect. Peanut allergy rates have doubled over the past 10 to 15 years. As peanut allergy rates increased, the clinical practice guidelines of early peanut avoidance in the U.S. were lifted in 2008. Recent and historic research in the 2015 and 2016 Peanut and Allergy (LEAP) trials led by Dr. Gideon Lack have shown that early consumption of peanut products in high-risk infants with severe eczema, egg allergy or both, reduced the risk of developing a peanut allergy by 80% by 5 years of age. The persistence of oral tolerance to peanuts (LEAP-On) trial published in March 2016 showed that the absence of peanut reactivity is maintained even without continued exposure to peanut products. Most recently, the National Institutes of Health recommend that at-risk children, like children with eczema, be fed peanut-containing foods as early as 4 to 6 months old. Can a peanut allergy be rid of? That is the question that both allergist/immunologists and parents have in mind. Current studies like IMPACT will look at oral immunotherapy to see if regular exposure to a food allergen like peanuts can create tolerance and eventually rid of that food allergy. If your child currently has a food allergy and you need to learn more, check out FARE. FARE is an impactful organization focusing on food allergy research and education. Other exciting news are companies like our friends, Mission MightyMe. This company was founded by Dr. Amy’s friends, Catherine and JJ Jaxon, alongside Dr. Gideon Lack who led the LEAP studies, and Todd Slotkin who co-created FARE. Their mission is to increase food allergy awareness and to have a product with a purpose. As previously mentioned, it is recommended from the National Institute of Health that at-risk children be fed peanut containing foods as early as 4 to 6 months. To help with this, Mission MightyMe offers puffs with a purpose- puffs that have peanut and/or tree nut allergens. As parents want to be able to expose their at-risk children to peanut containing foods, puffs are typical food products that 4 to 6 month olds can usually eat. In sum- children with eczema are at-risk children for food allergies, particularly peanut and tree nut allergies. Based on current recommendations, children with eczema should be exposed to peanut allergens as early as 4 to 6 months old to lower the risk of developing a peanut allergy. Stay tuned as the food allergy and peanut allergy research continues to progress and recommendations change. ← October is Eczema Awareness Month- what is eczema?